I received a copy of the uncorrected proofs for an honest review from the publisher. Much as I love horror and other speculative fiction, I do enjoy taking a deliberate saunter down a different genre path. 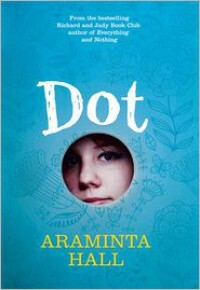 I was attracted by the synopsis and took a chance, which I am glad I did because I found Dot to be an engaging, well written and quite an absorbing diversion. This is a serious novel featuring two disconnected families, with seven flawed characters who show bad judgement throughout, you would struggle to find a redeeming feature amongst them. Lack of internal communication en la familia becomes an art-form in this multi-viewpoint story. The only person it seems the characters will 'speak' to in any great depth is the reader, whom they let in on their secrets, big and small. I was not quite certain that I wanted to know, but I felt compelled to watch, like a rubbernecker at a car crash. Araminta Hall makes effective use of flashback, letters, first person, and I will say it here, she is a very good writer. There was some the humour, so it did not totally turn into the book you would want to slit your wrists to. I must admit I was (assuming) hoping that we were heading towards a different conclusion, probably more to do with my zombie novel upbringing more than anything else. Regardless, I am afraid the end got the old eye roll from my corner of the sofa. Whilst I enjoyed it, it is not going on the read again pile.